Animals and Me, We're more alike than you might think! by Marie Greenwood. DK Publishing, 2010. Available now. This DK book is not only multi-cultural, it's multi-species! Each double-page spread in this 48 page book concentrates on one aspect of life, comparing the way people (usually kids) do it to animals'. First, the page examines YOU, then goes on to examine other animals. Cover up = your skin v. fur/ feathers/ tortoise shell. Feet First = all sorts of feet. 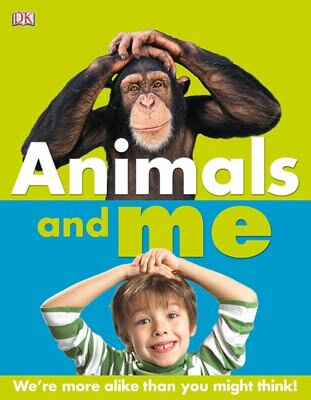 Readers will be fascinated with the many ways animals are the same and different from people. 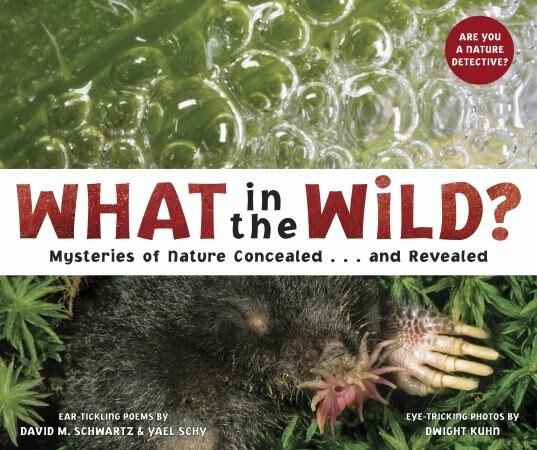 More Nonfiction Monday reviews can be found at the Playing by the Book blog. Click away. I've had two manuscripts sitting in my Vermont College file, both ready to send as my workshop submission. But which one to send? Which one? I really want to work on one of them with a college advisor. But do I want to workshop it, too? The other one was workshopped last March at the novel writing workshop, and has been revised since then. Should I send that one to get fresh eyes on the revised version? Well, I finally took the plunge and sent my dog story off to be added to the workshop booklet. They said we'd get our group's workshop booklet two weeks before the semester begins. Which will probably be after Christmas. I can't wait to see what the other writers submit. Gotta get up and fix the turkey. Alarm went off at 7:30. Well, this was supposed to be a 10 - 12 pound fresh turkey, so I had bought a throw-away aluminum roasting pan supposedly large enough for a 15 pounder. As usual, the fresh turkeys grew larger than planned and we ended up with a 14 pounder. Still should fit, you say? The darn thing has the longest legs of any 14 pounder I've ever seen. Legs extend over the pan. Body fits snugly into the pan, leaving no room for turkey juices (for gravy) to gather. Make trip to grocery store to buy larger pan. Insert stuffed and buttered turkey into second pan. Now the family, plus my husband's brother, are sitting around the woodstove, waiting for the turkey to be done. 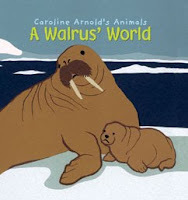 Caroline Arnold's Animals -- A Walrus' World. Picture Window Books, a Capstone imprint, 2010. Available now. I was digging through the box of books that Capstone had sent me, looking for a book to review when I found one by my favorite easy reader nonfiction author, Caroline Arnold. When my own children were just learning to read and wanted information about animals, I always knew that Caroline Arnold would have something to interest them. This series, however, isn't the photographic illustrated book I normally expect from her. This time around, she is illustrating the books herself with cut paper, instead. Which means, of course, that the double page scenes seem to be up close and personal. As the book progresses, a baby walrus grows up. During the summer, he and his mother joins a herd of female walruses, but in the winter several thousand male and female walrus join forces for protection and warmth. 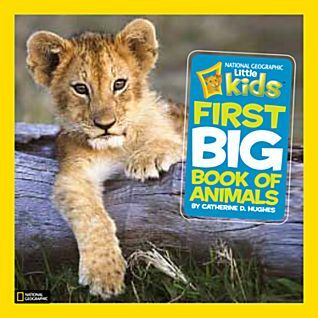 This is told in story format with yellow rectangles sprinkled on the pages offering more factual information about the beasts. The book is square -- 11 inches on each size -- and could cause a problem in a library with tight shelving. As it is, it's just barely going to fit in my library with the 12 inch spacing between shelves. For first and second grade readers. More Nonfiction Monday reviews can be found at Diane Chen's SLJ blog, Practically Paradise. National Geographic Little Kids First BIG Book of Animals by Catherine Hughes. 2010. Available now. From the beginning photograph of the giraffe's head sticking out his purple tongue to the zebra at the end, staring at you as if asking if he can go home with you, this book is set up to fascinate youngsters and their older caretakers alike. 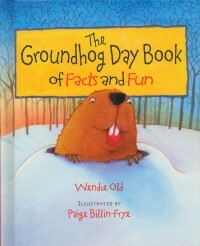 Thirty different animals are covered under chapters such as: Grassland, ocean, Desert, Forest, and Polar. Don't let the 128 page thickness of the book put you off. 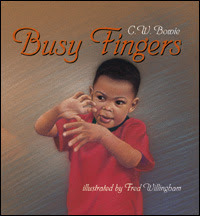 This book is made for preschoolers and early readers. The wonderful National Geographic closeup photographs showing the animals in action or calmly watching the reader make you feel they are right in the room with you. And the large type, easy reading sentences simply invite early readers to come in and explore. 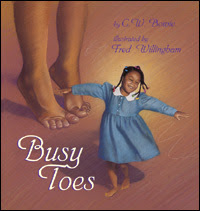 More Nonfiction Monday book reviews can be found at In Need of Chocolate blog. We have bird feeders all with squirrel protectors on top. A lotta good that does. Our squirrels learned long ago (and have passed it down to all their children) how to leap off the tree limb, slide around the squirrel proctors, skoot down the bird feeder head-first, to enjoy the feast there. Even the square cage of suet isn't exempt. They just slide down the wires holding it. But the topper was when I caught some squirrels 'flying' over to the bird feeders. They paced back and forth on the tree limb. Scooted part-way down the tree trunk, then with a mighty leap they managed to reach the bird feeder before falling to the ground. Unfortunate things happened to any poor squirrel who was already on the bird feeder when one of them did this leap-flying trick. The surprised current occupant fell to the ground, still clutching the sunflower seed he had been chewing on. Last week my husband bought special squirrel food for them and scattered it on the grass about 10 feet from the bird feeders. Oh my. What a fuss they made over that. One squirrel raced to the pile of food, grabbed one peanut and raced off with it. Then another. 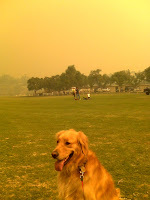 and another and another. What a fight, with nasty squirrel chittering, if two of them grabbed the same peanut shell! A tug of war settled the matter. 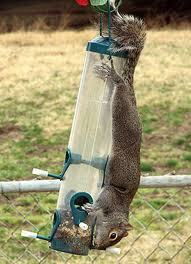 Have you managed to figure out how to keep squirrels out of your bird feeders? A lovely surprise for today, November 7th. 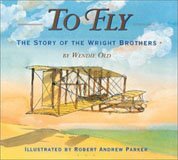 Anita Silvey is featuring my book, To Fly, the Story of the Wright Brothers on her new blog, Anita Silvey's Children's Book-a-Day Almanac. Wow, she does a beautiful job describing books, doesn't she? I've always loved her books about writers and illustrators and am thrilled she included one of my books on her blog today. Mailed two more manuscripts out. Do you remember last year's discussion of the number of pumpkin pies I have to make in November? Well, that is now a picture book and I've been mailing it out. Someday it might even land on that certain wonderful editor's desk who loves pies and might even like the story. The election is over and you lost. Now, please tell your people to remove the multiple signs shouting your name, which they placed every 10 feet for a couple of hundred feet at almost every road crossing on many of the roads I travel to work. They were annoying before the election and still are annoying. I hope everyone voted on Tuesday. There is no way that I could NOT vote. My grandmother marched with the Suffragettes to earn the vote for women and I wouldn't shame her efforts by not using that privilege.